Here, the Atlantic Ocean and inter-coastal waterway meet. This transition area offers not only redfish, trout, snook, flounder and summertime tarpon, but bluefish and jack crevalle also enter into the picture. These are two very aggressive and hard fighting species that, while not prized for their food value, are pound-for-pound some of the hardest fighting fish you’ll find. Part of the Atlantic Inter-coastal waterway, the Halifax River is the main inshore body of water in the area. Here you’ll fish oyster bar points, ledges, under docks and around other structure primarily for redfish and speckled sea trout. 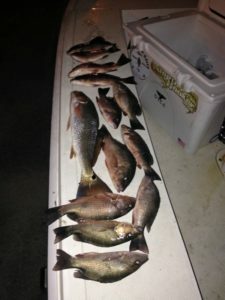 Depending on the skill level of the angler, and what the fish are wanting, we’ll use a variety of fishing techniques including artificial baits, cut bait, as well as live bait. 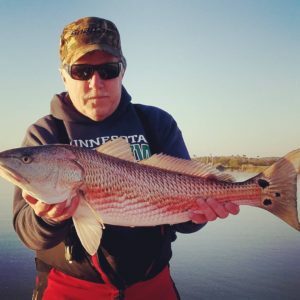 One of the truly unique fishing opportunities is site fishing for “crawling” redfish. We’ll visually locate redfish feeding on the river banks, in mere inches of water, with tails and backs breaking the surface of the water. You’ll cast directly to the fish and actually watch the drama unfold as the fish takes your bait and makes a run for it! Feeding into the Halifax River, the Tomoka River and it’s basin offer a wide range of fishing opportunities. 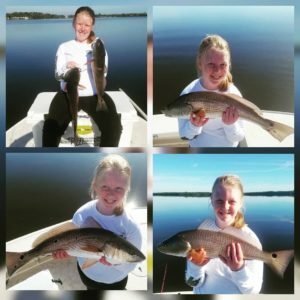 Here, not only are redfish and trout a possibility, but black drum, tarpon, flounder, snapper, and snook are also fish that you’ll target while fishing this area. A particularly exciting seasonal opportunity in this area is using live baits and jerk baits to target tarpon that frequent the area from late spring until mid summer. You’ll locate tarpon as they roll on the surface of the water, then cast your bait to them and hold on for a great fight! Our main hunting will be with waders in a bank blind but will have a duck blind boat for those that might need it or depending on the circumstance. We may use as many as 100 decoys or as few as 6 decoys. Every week is different and we have to adapt to what the ducks want to see! During our hunts, some of the most common species of duck include Scaup (bluebill), Blue and Green Winged Teal, Ringnecks, Mottled Ducks, Hooded Mergansers and Common Mergansers. We try to provide you with the very best outdoor experience you could have.What To Bring With YouFlorida weather can change fast so you will need to bring your favorite camouflage, some wet weather gear (camo is best but brown or green will work). 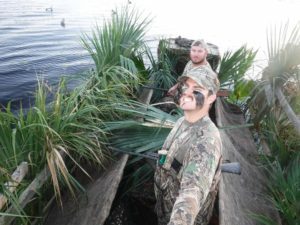 You might be in Florida but the temperature can be cold most the time (in the 30’s and 40’s) — If you’ve never been duck hunting before 30-degree weather on a 30 plus mph boat it can get chilly. I like to have my customers bring a small backpack or blind bag with the following: flashlight, gloves, snacks, drinks, camera, and whatever else you would like to bring, Waders are a must! Any chest waders will work but I prefer neoprene on where we hunt. We might be able to get away with knee boots but most of the time we use chest waders. When you get here you will be required to have a state hunting license and state duck stamp. Don’t forget to bring your federal stamp as well!!! I like to use a 12 ga. 3″ to 3-1/2″ #2-4 STEEL SHOT for most our hunting. You can also use a 20 gal. with 2-3/4″ #2-4 STEEL SHOT. Please have a gun case for your shotgun. You will also need to have a good cleaning kit for our salt water hunts. Your gun will need to be plugged to only have 3 shells. NO LEAD SHELLS!!!! We will be targeting Red Fish, Trout, Flounder, Black Drum, and Snook plus many other species that are feeding in the flats, drop offs, oyster bars on rivers, creeks and basin . All tackle, fishing license and bait will be provided for you on this trip. A great way to work a trip into your busy work schedule is a night time trip with Capt. Billy. 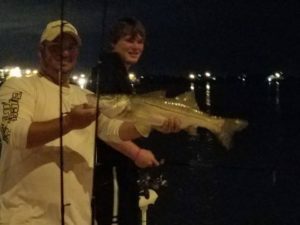 You’ll fish around docks where artificial lighting causes large trout, snook and many other species to. 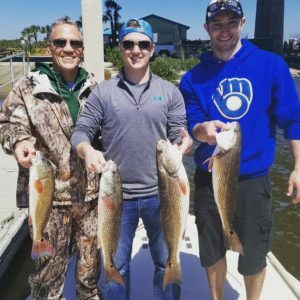 Known as one of the premier redfish fishing destinations in the world, you’ll fish the shallow flats for not only redfish, but sea trout and black drum using a variety of techniques. Our main hunting will be with waders in a bank blind but will have a duck blind boat for those that might need it or depending on the circumstance. We may use as many as 100 decoys or as few as 6 decoys. Every week is different and we have to adapt to what the ducks want to see! 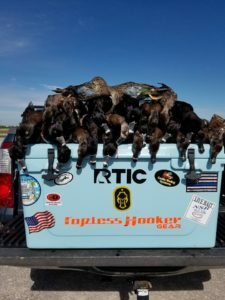 During our hunts, some of the most common species of duck include Scuap (bluebill), Blue and Green Winded Teal, Ringnecks, Mottled Ducks, Hooded Mergansers and Common Mergansers. We try to provide you with the very best outdoor experience you could have.What To Bring With YouFlorida weather can change fast so you will need to bring your favorite camouflage, some wet weather gear (camo is best but brown or green will work). You might be in Florida but the temperature can be cold most the time (in the 30’s and 40’s) — If you’ve never been duck hunting before 30 degree weather on a 30 plus mph boat it can get chilly. I like to have my customers bring a small backpack or blind bag with the following: flashlight, gloves, snacks, drinks, camera, and whatever else you would like to bring, Waders are a must! Any chest waders will work but I prefer neoprene on where we hunt. We might be able to get away with knee boots but most of the time we use chest waders. When you get here you will be required to have a state hunting license and state duck stamp. Don’t forget to bring your federal stamp as well!!! I like to use a 12 ga. 3″ to 3-1/2″ #2-4 STEEL SHOT for most our hunting. You can also use a 20 ga. with 2-3/4″#2-4 STEEL SHOT. Please have a gun case for your shotgun. You will also need to have a good cleaning kit for our saltwater hunts. Your gun will need to be plugged to only have 3 shells. NO LEAD SHELLS!!!! When you mention Daytona most people think of “beach” and the great saltwater fishing in the area. However, just 40 minutes inland are some spectacular freshwater fishing opportunities. Fed by the St. John’s River, Lake George, Lake Dexter, and Lake Woodruff lie adjacent to the Ocala National Forest and the Lake George State Forest. Untouched by development and surrounded by natural beauty, these bodies of water offer winter time crappie fishing, as well as year-round bass fishing, which can be spectacular in the spring time. Additionally, De Leon Springs offers both untouched beauties as well as crystal clear spring fed waters that offer bass winter time protection from cold winter waters. 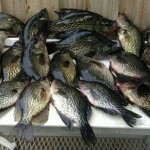 Fishing license for everyone on board, bait, tackle, rods & reels, ice, water, sun screen, as well as fish cleaning. Camera, and a hat or cap to protect yourself from the sun. Polarized sunglasses are also very important, particularly for sight fishing. During cooler months a light jacket for early morning and colder days is also wise. If you plan on taking fish home with you, bring a cooler. Also, the balance owed on the trip is due on the day of your trip, so please be prepared to pay with cash, check, or credit card. If you are going out on a guided bass trip and wish to fish with live bait, please be prepared to pay an additional bait cost.